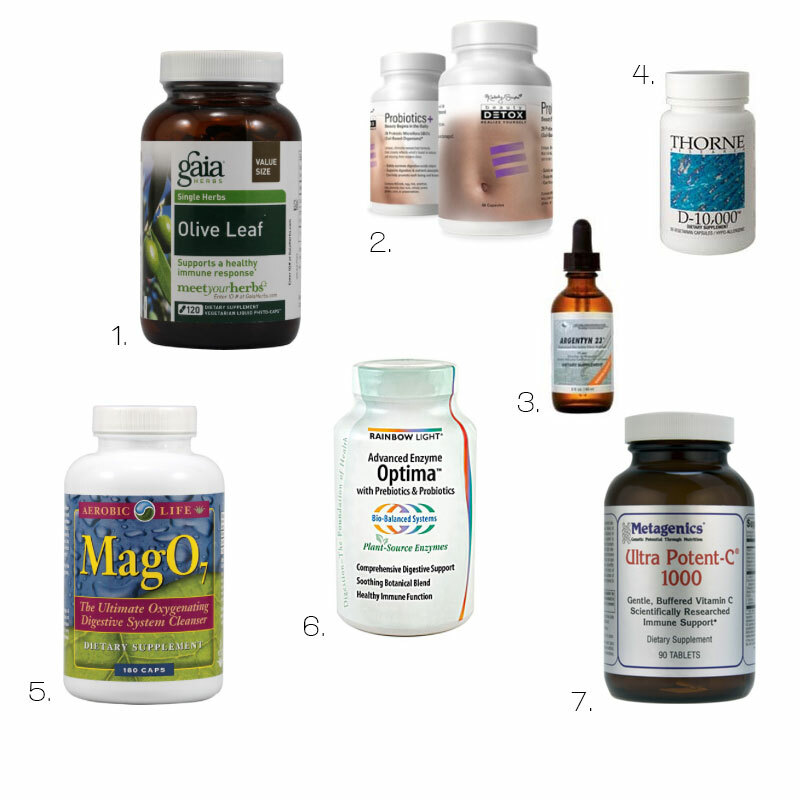 I am sharing my top 7 supplements to avoid getting sick. 1. Olive Leaf Extract may help prevent cold and flu viruses, sore throats and sinus problems. Research supports OLE kills bacteria, yeast and viruses that cause herpes, HIV, bronchitis, shingles, TB, pneumonia, hepatitis, HPV, candida and more. It is excellent for your heart and circulation as it relaxes the blood vessels and prevents the oxidation of LDL, the bad cholesterol. I no longer need to use a neti pot or nasal sprays since taking olive leaf extract daily. I take OLE daily and increase the dosage if I feel like I am getting sick. 2. Probiotics are the building blocks of a healthy digestive system. They help digest food, keep pathogens at bay, aid your immune system and so much more. I take one capsule of Kymberly Synder’s Probiotic plus daily. I have tried several brands and preferred the soil based ingredients used in Kimberly Synder’s brand. 3. Colloidal Silver is a mineral used for hundreds of years as a natural antibiotic. Colloidal Silver can penetrate the wall of the virus and cause the virus to die. Be careful which brand you buy because not all the Colloidal Silver products on the market are the same. I use Argentin 23. Gargle and swallow for 30 seconds, and do this multiple times a day if you feel like you are catching a cold. Carry Argentin 23 when you travel, especially on airplanes. It’s an excellent emergency therapy to have on hand. 4. Vitamin D is an essential nutrient that helps your immune system fight viral and bacterial infections. Vitamin D is a hormone you get from sun exposure. The only reliable sources of vitamin D are the sun and supplements. Ask your health care provider for a 25-hydroxy-vitamin D (25 OH vitamin D) test to determine your vitamin D status. 5. Magnesium Oxygen can support your body’s natural elimination and cleansing process. It is my secret to a flat stomach. I take two capsules of Aerobic Life Mag 07 before bedtime. Mag O7 is not a laxative and is not habit-forming. Kimberly Snyder recently introduced a Magnesium Oxygen supplement called, Detoxy+. Kimberly uses the supplement mostly for travel. Frequent travel causes stress on the body that can wreak havoc on the digestive system. If you experience frequent constipation and bloating, you may find this supplement beneficial. 6. Digestive Enzymes promote better digestion and help improve the absorption and assimilation of nutrients into the body. One of the brands I like is the Rainbow Light Digestive Enzymes. I take one or two capsules before a heavier meal. 7. Vitamin C is an essential nutrient that aids your immune system in fighting infections and maintaining strong immunity. I prefer the Metagenics brand due to the high quality of ingredients. I’d love to hear in the comments below what supplements you take and how they’ve positively impacted your life.